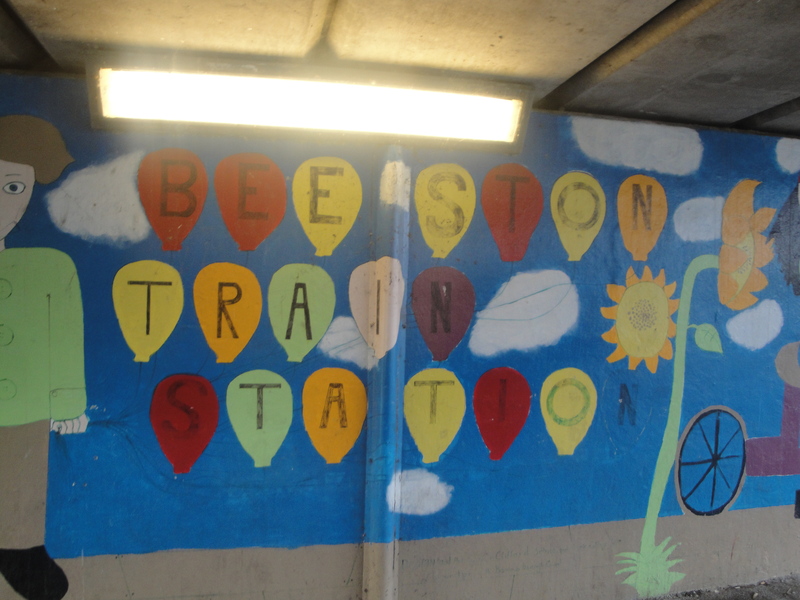 Even before we left the station at Beeston I had spotted somewhere to get some food, and if it was not for the fact that we were heading to the Victoria for lunch I would most probably have stopped in there for a little snack. 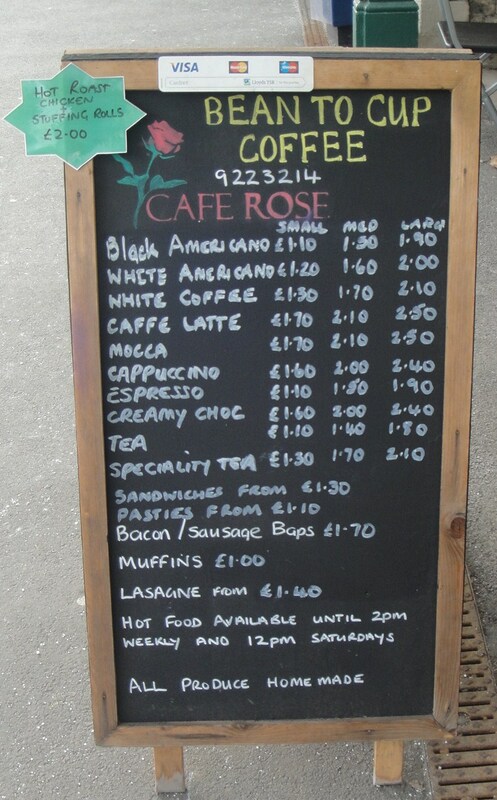 “Cafe Rose” nearly pulled me in with that little green star offering a Hot Roast Chicken and Stuffing roll for £2, further down the board there was the offer of Lasagne for £1.40, although it does say ‘from’ £1.40 so I wonder if you pay by the layer or by the bite? I will find out one day. Apart from all that the note that ‘All produce homemade’ made me happy that it was not just another generic coffee chain housed in the station. 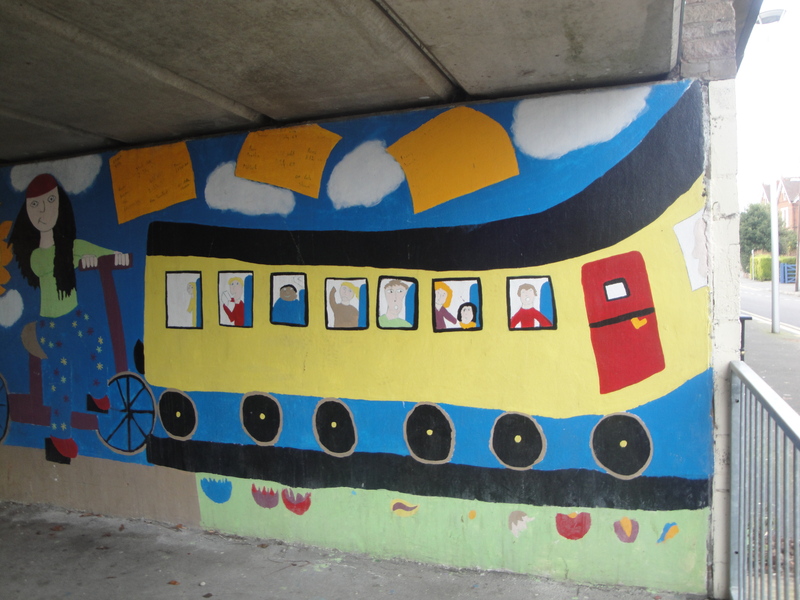 Just outside the station as you walk to the main street is a really colourful mural on the wall of the underpass. Any of you that have read my other blog “The El Stop Food Hunt Project” will know that I am a sucker for this kind of thing, so I just had to stop and take a picture. 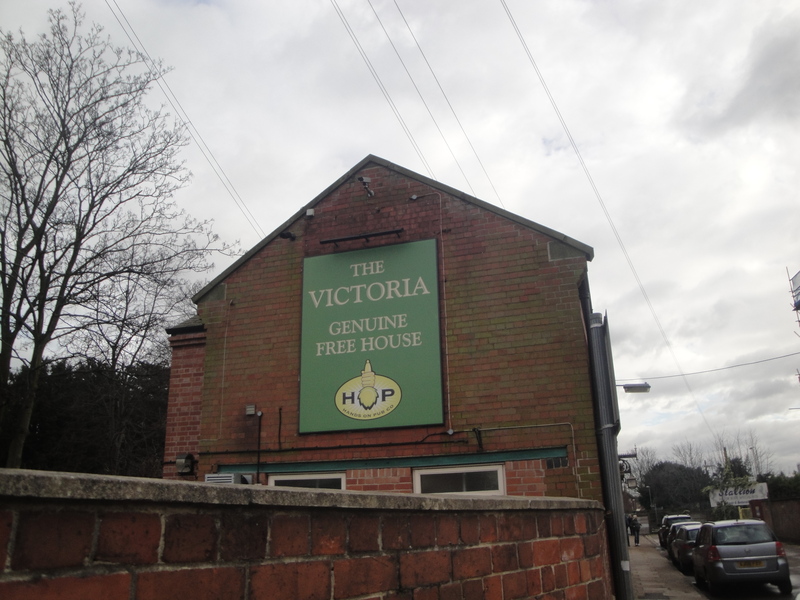 As this part of the food hunt was checking out the pubs in Beeston on the ‘Discover the Route to Real Ale’ guide it seems a good idea to have a little chat about some beer. We took advantage of the beer platter for £3.20. 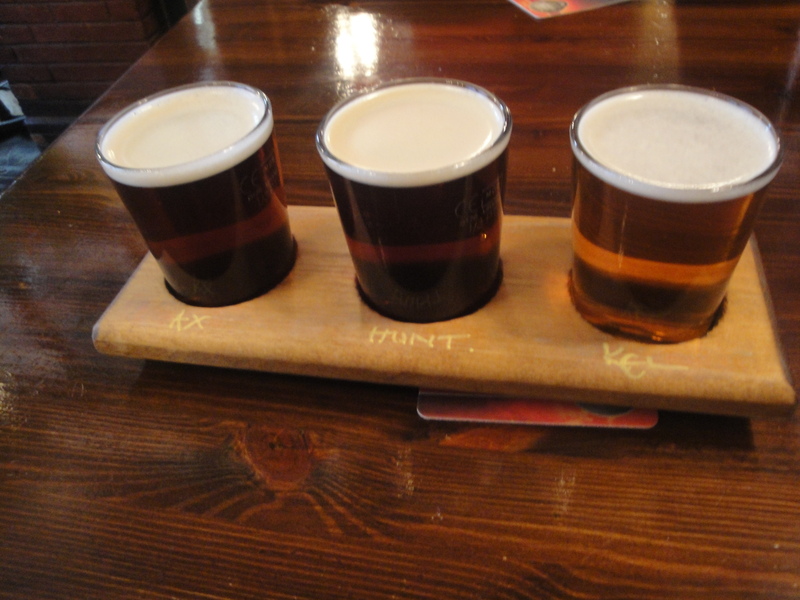 This is ‘your choice’ of three beers from the draft board served in third pint glasses. I opted for the following. First choice was the Axholm IPA described on their website as “A pale and refreshing beer, powerfully hopped with English hops. A fresh and spicy take on the pale ale style, with grassy and herbal flavours dominating. Crisp flavours with a rounded bitter finish.” from the Axholme brewery based in the Isle of Axholme, in North Lincolnshire. 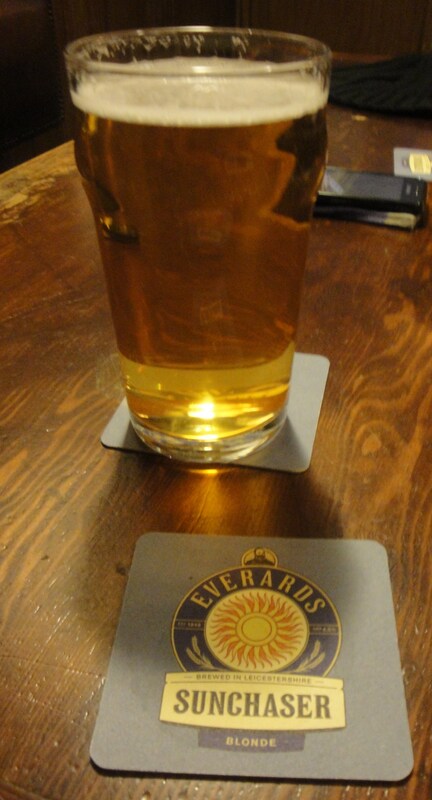 The good thing about these little taster sized trays is that if you dont like the beer you are not stuck with a whole pint to drink. The downside is that you can be left with three smaller glasses of beers that you don’t like left to drink. Luckily on this occasion they were all OK, although there were a few brief moments at the start when I had my doubts. 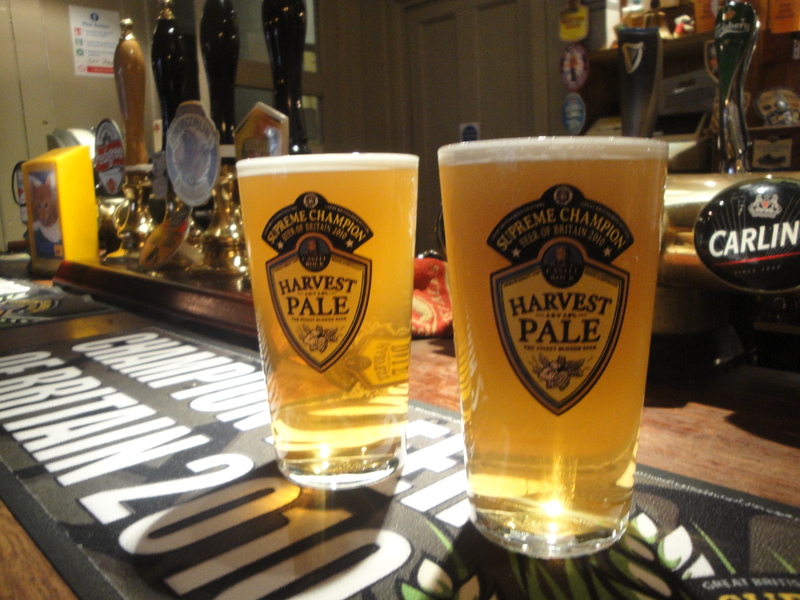 For the record we also had a really nice pint of Harvest Pale, just could not resist. 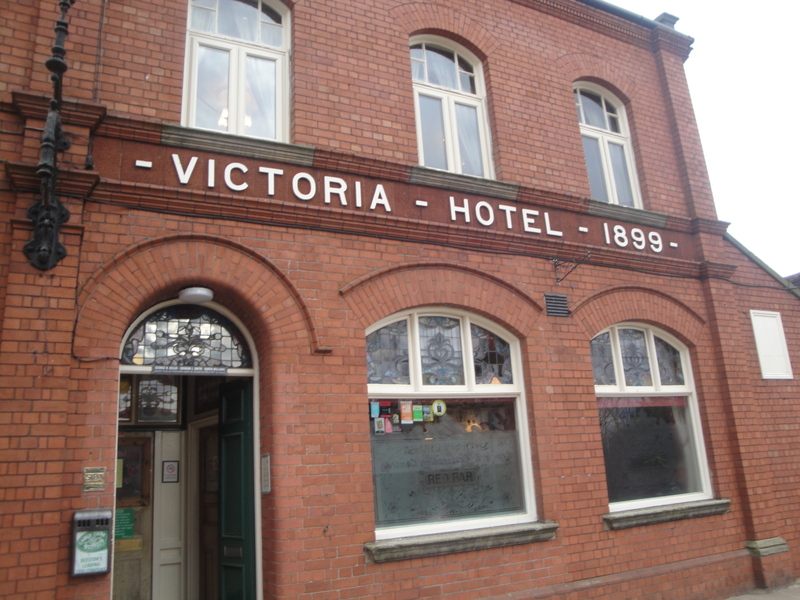 We left the Victoria Inn and with the “Discover the Route the Real Ale” guide in hand headed out to seek out the next recommended stop which was the Crown Inn in Beeston (Stop No. 8). 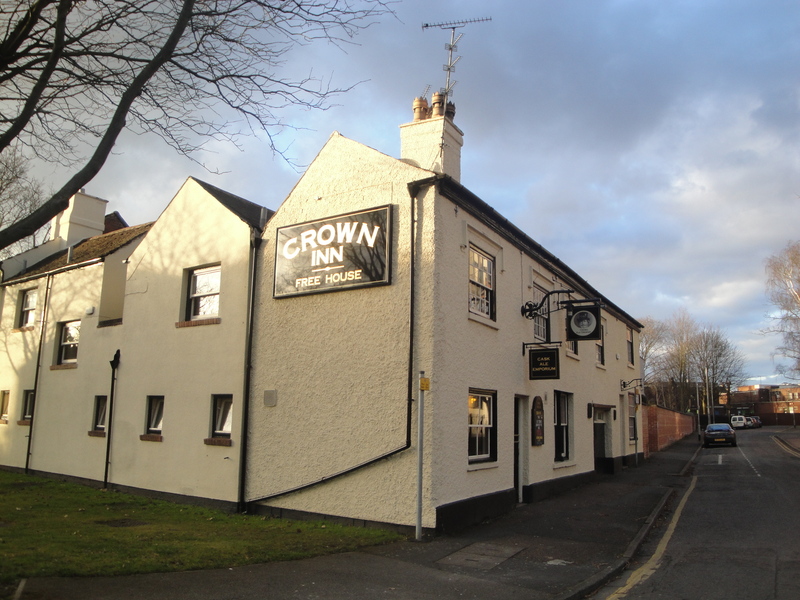 For the first time the sat nav (or GPS) on Martin’s phone came into its own and we followed the yellow blip like two of the three wise men following a star in the sky until we spotted the Crown Inn sign in the distance. This is a proper pub, with lots of small partioned rooms that you can get a pint and lurk, or read your paper, chew the fat, play darts etc. The sort of pub that you pick your room and that is where you drink. Your old man might be drinking with his mates in another room and the ony place you would bump into each other would be the gents. 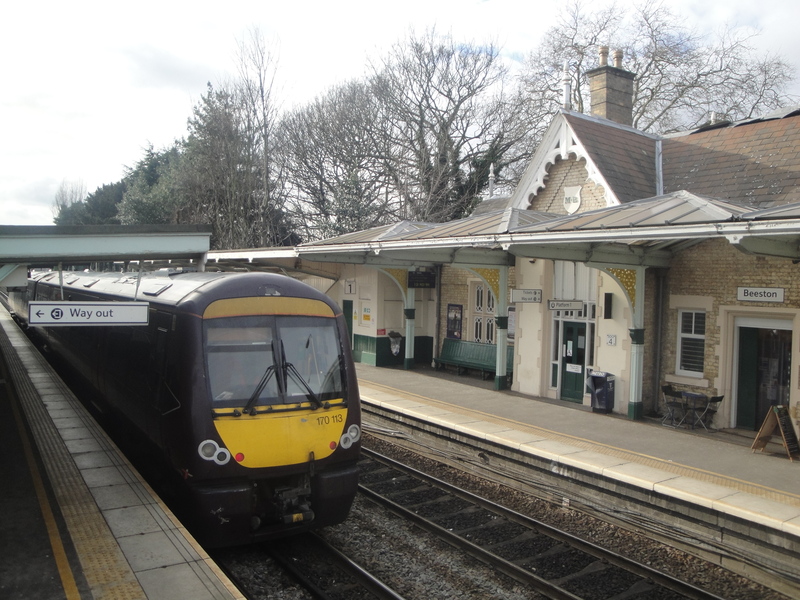 I don’t know if it still exists, but many many years ago I went to a meeting in a pub in York that was a talk by the “Campaign For Real Pubs” that was in the early Nineties, sadly last year we drove past that same pub only to discover that it had been knocked down and was now a block of flights. Anyhow I digress. 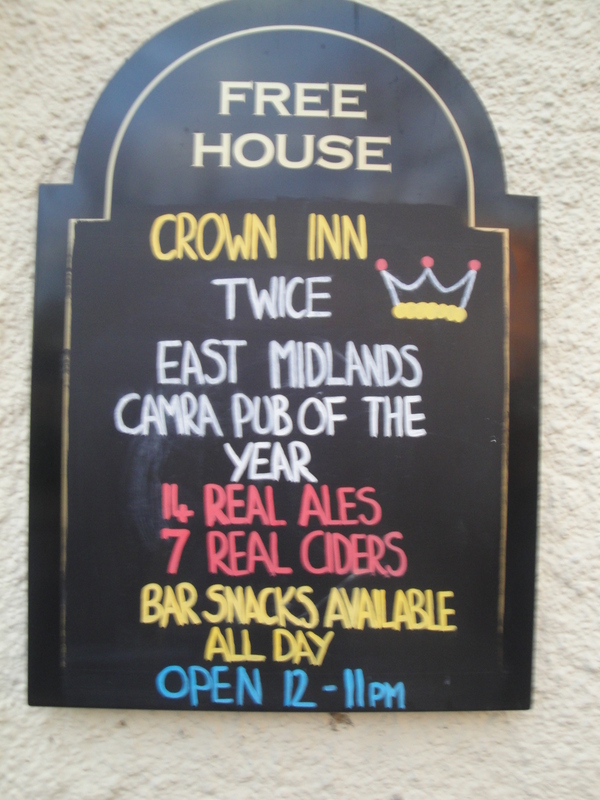 There is not a particular massive selection of food on offer at The Crown, but you get cobs, pork pies, sausage rolls, and scotch eggs. 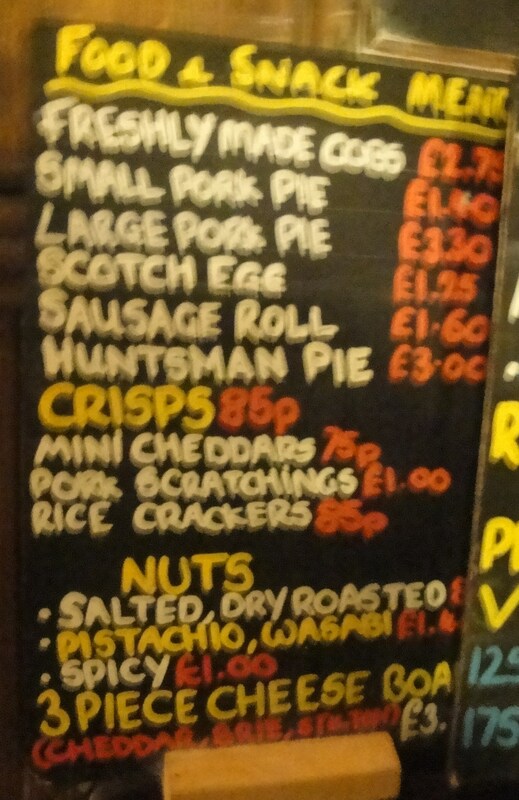 So plenty of basic bar snacks of the genuine snack sized variety. They also do a simple Cheese board which is three pieces of cheese; Cheddar, Brie, and Stilton for about £3. But enough of all that, I just finished my Sunchaser so it is time to plug in the next stop on the trail into the GPS and move on. 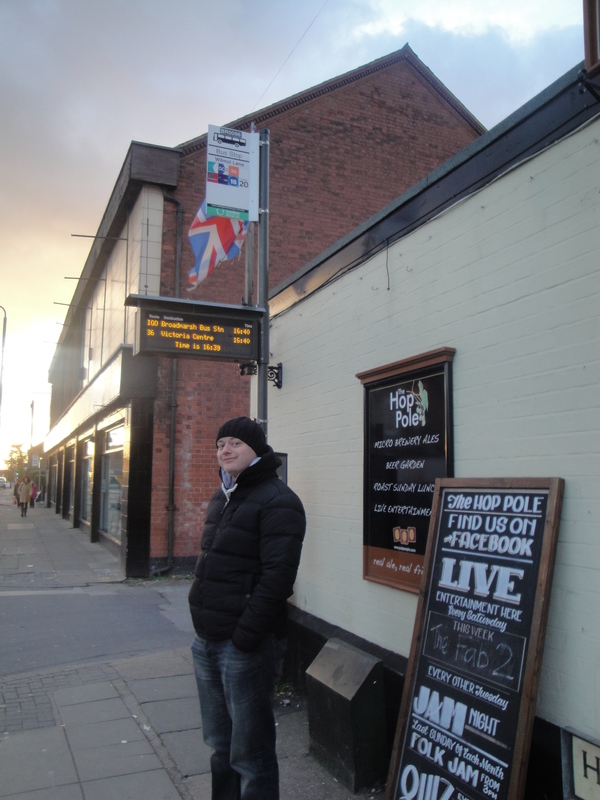 The last stop on this brief exploration of Beeston along the ‘Discover the Route to Real Ale’ trail was the Hop Pole. 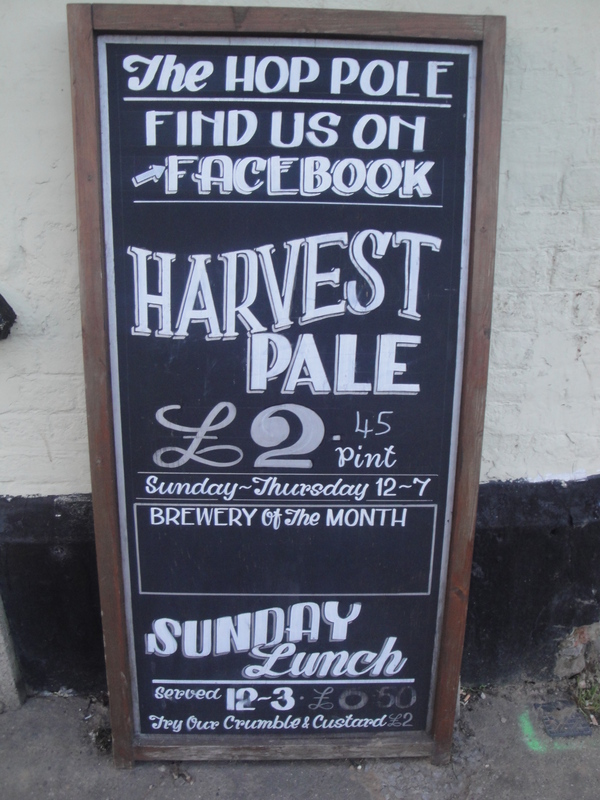 As we arrived I was particularly pleased to see the chalkboard outside adverting the availability of Harvest Pale. Tucked away at the bottom on the board was their food offering which was the Sunday Lunch. 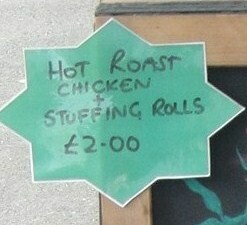 Sadly not on offer the day we were here. There is nothing like being provided with ‘back lighting’ for your pint of beer, especially if you are one of those sad blogging individuals who are insisting on taking a quick picture of said pints of beer for later display. ‘Guilty as charged m’lord’. It was a good beer, one that I keep on going on about so I will shut up now. 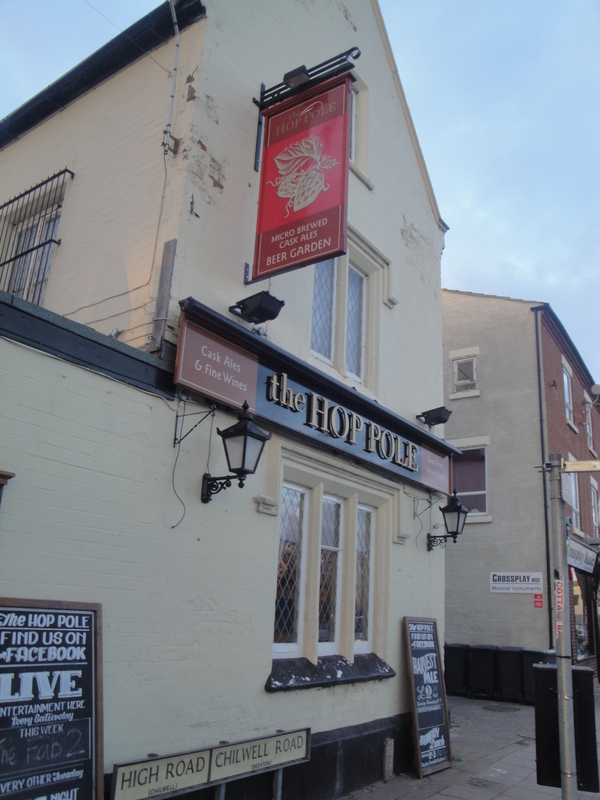 The Hop Pole (Stop No. 14) is quite a nice pub with some charm, a good selection of beers, and it is handily placed right next to a bus stop and will eventually when phase 2 of the tram is finished will be on the tram line. While it did not have that much food on offer it did have a lot of cafes and resturants in the near vicinity so is worth stopping at for a pre-dinner pint. Some good beers, three more pubs in the guide tracked down, and a few more places noted that may be worth popping back to for some food. Nice! Maybe for my next trip back!